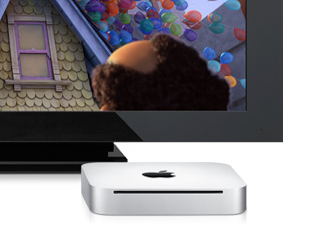 Last night, as we waited to pre-order the new iPhone 4, Apple had a surprise for us: a new Mac mini. Never having owned a Mac mini, normally this wouldn’t get me excited. But this one is different. This time, Apple decided to include a HDMI port and is highlighting the fact that you can easily hook it up to your HD television. In other words, it’s like an Apple TV on steroids. And it looks like Apple knows it. If you go to the Apple Store website right now, you’ll notice that every big piece of Apple hardware is highlighted except one: Apple TV. 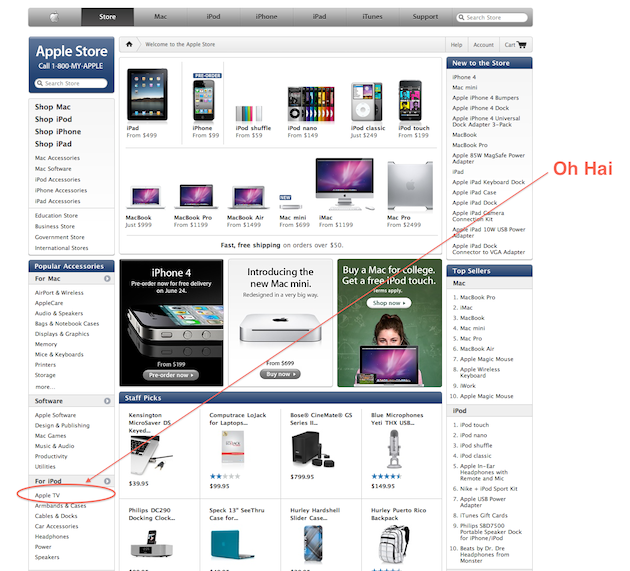 If you’re looking for it, you’ll either have to do a search, or you’ll want to look way over in the lower left hand corner under “For iPod.” Yes, Apple is now classifying the device they’ve famously belittled as a “hobby” for so long as an iPod accessory. Ouch. Apple’s decision to add a HDMI output and highlight the TV-hookup capabilities of the new Mac mini is made more interesting by the recent rumors that they’re working on a new, cheaper cloud-based version of the Apple TV. It’s not clear when such a product would be ready to go, but you can bet that Apple is going to use the next few months to see how the Mac mini sells as a living-room compatible device. And how it sells could make a significant impact on Apple’s future forays into the living room. At $699 (for the cheapest model), the Mac mini is well beyond a price point that most people would be willing to pay for a set top box. Hell, most people didn’t seem willing to pay the $229 that the Apple TV sells for. Earlier this month, Apple CEO Steve Jobs was quoted as saying, “no one is willing to buy a set top box,” when explaining the Apple TV’s lack of adoption. What he really means by that is that no one is willing to buy a set top box at the high hardware margins that Apple is accustomed to. But with the Mac mini + HDMI, they’re offering much more than they ever have before — so this may well be a bit of a test for Apple. The rumors about the new Apple TV have the price at $99. That seems like a decidedly un-Apple price for such a piece of hardware. But now that they’re seeing main rivals Google and Microsoft entering the living room in a very real way, they may feel they have no other option. I still bet that eventually Apple forgoes the set top box route altogether and makes an actual television; a device which people are used to spending much more money on. And a device which (thanks largely to the cable companies) has an awful user experience. I also think Apple may be pleasantly surprised by the number of people who buy a Mac mini for their high-end home entertainment centers thanks to the HDMI addition (people have actually been doing this for a while, but had to use converters — it was more of a pain). Had they included a Blu-ray player in the mix, the thing might have done even better. But Apple has made its position clear: physical media storage formats are dying — it’s iTunes or bust for content. And seemingly for now in the living room, it’s Mac mini or bust for Apple.